The UK premiere of an entertaining, albeit slightly disappointing, musical adaptation of a modern film masterpiece. It’s tricky to keep preconceptions at bay when you know that the plot and style of a film has been a winning combination. The 2006 film that is the basis of Little Miss Sunshine, which starred Abigail Breslin as the determined young pageant contestant, Olive, was adorned with awards. The epic plight of the Hoover family on their 500-mile journey to get Olive to her pageant in time shaped its legacy: an audacious comedy that portrayed a joyful, and moving, excavation of a family trying to break free from a run of bad luck. 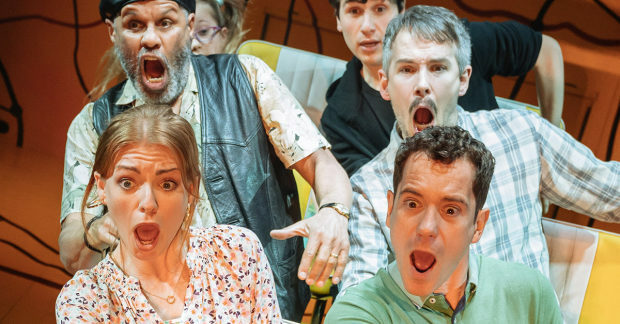 Little Miss Sunshine at the Arcola makes a solid attempt at adapting the film into musical form. In theory, the show follows through with translating many of the elements that made the movie so mesmerising. The two hours fly by in a sunshine-yellow stream of the same bizarre, colourful events that pepper the narrative of the film. However, it does not quite capture the pathos of its screen predecessor. The journey is entertaining to watch: an amusing, and relatable, insight into the pressure-cooker that is a family of six crammed into a small space for a long period of time. The show captures the Hoovers’ differences well: the inappropriate, coke-snorting Grandpa (Gary Wilmot) is the polar opposite of his over-bearing, success-obsessed son, Richard (Gabriel Vick); the warmth that radiates from the exceptional Sophie Hartley Booth, one of three young actors playing Olive, thaws the cold shoulder of her older brother Dwayne (Sev Keoshgerian) who is perpetually mortified by the other family members. 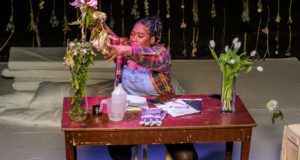 However, the fast pace of the show halts the development of the relationships, the production cramming so many events into only two hours, including an interval. I’m all for a show where I’m in bed by 10:30 but, on this occasion, with 18 songs and the relationships of six characters to build, it would perhaps have been better to slow down. The characters are well drawn, but the dialogue is perhaps too punchy. The musical feels more like a whistle-stop tour of their personalities, rather than a full investigation of the motives that lead them to jump in the bus and fight all odds to make Olive a superstar. The script is peppered with so many one-liners that they take precedent over the slow-burning evolution of the emotional journey of the characters which made the film a masterpiece. The musical does seem to take a lot from the screenplay, and it just doesn’t translate well when it is competing with so much – choreography, musical numbers and constant changes of scenery. It feels like emotions aren’t given the space to run high. There is one scene in particular, very well-known from the movie, which involved the absolute outrage of Dwayne (if you’ve seen the film you’ll know, I won’t spoil it for those not familiar). The scene is so intensely devastating that it leaves a viewer distraught. In the musical, the moment is far too fleeting. Little Miss Sunshine is a decent evening out. The music is bubbly, although a little unmemorable, and it sits well with the quirkiness of the plot-line. 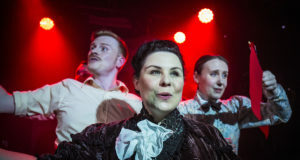 There are some really, really funny scenes (particularly from Imelda Warren-Green, who provokes laughs in spades), and the cast do have a great rapport. The younger members of the company have immense comic timing, sass, and are a total joy to watch. The show could have just put the brakes on its road-trip a little.